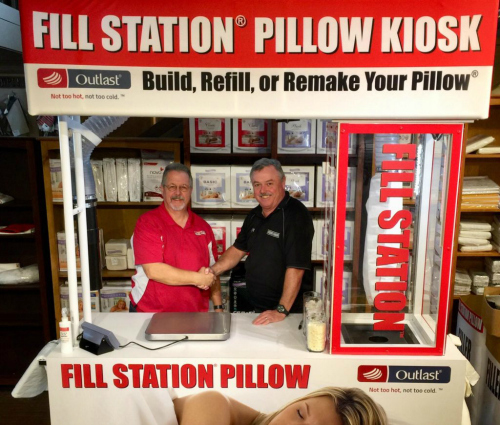 NANAIMO, British Columbia – The Fill Station, a kiosk that allows customers to build customised pillows has opened its first international location at John’s Bedroom Barn, a two-unit furniture and mattress retailer based here. Based in Spring Hill, Tennessee, Fill Station has 30 locations in the United States. John’s is their first Canadian franchise. Customers can choose from an assortment of pillow covers and protectors to meet their needs, and can even purchase aromatherapy pillow sprays made from 100% natural, aromatic compounds carefully extracted from plants for a better night’s sleep. Not only is there a wide variety of options available to customers, but Fill Station offers a five-year guarantee; in the five-years post-purchase, a customer can return to any kiosk for an annual re-fluffing and adjustment.